Sometimes it can be hard to remember how time zones relate to one another. Is it 5 or 6 hours ahead, or behind? What part of the country are you in…East? West? Then, of course, there are other things to remember, like the fact that daylight savings is at different times in different countries, so sometimes the zones are less or more hours apart? Sigh. 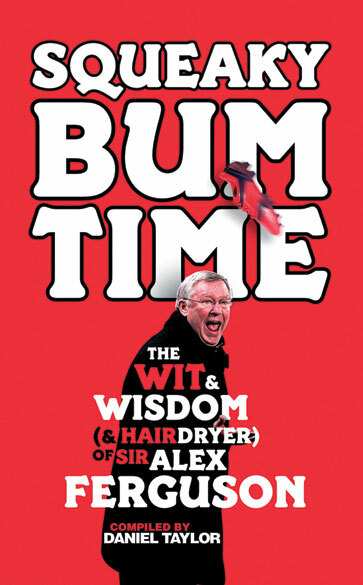 So, if you are wondering what time it is over here, the answer is squeaky bum time! If that doesn’t help, let me give you a little background. You can not tell squeaky bum time on a watch, it defies the traditional use of timekeeping. The phrase was coined by the esteemed Sir Alex Ferguson; 27 year manager of Manchester United – I know, let the bias creep in. According to Collin’s Dictionary online, it means “the tense final matches (or minutes) in the race to a league championship (or any championship/achievement)”. Another definition that I found elaborated even further, describing “Squeaky Bum Time” as the sound your bum makes shifting around on the edge of your seat during the most tense periods of a competition. Frankly, I don’t care what you think about Manchester United, or Sir Alex Ferguson, the phrase is not only incredibly apt – not to mention, fun to say – it is also something that most people can say they have experienced in some part of their life. I think it is safe to say that it is “squeaky bum” moments that really make the sporting world go round. While the climax of “squeaky bum time” usually only lasts a few moments, the build-up can sometimes take weeks. The longer the build-up the squeakier the bums. I am currently in the middle of a squeaky bum extravaganza. No, that is not my way of saying that I have really bad gas. To begin with, a few weeks ago, I was lucky to experience Squeaky Bum Time with Fergie himself, at the place that he calls home (well at least in footballing terms). I was offered the opportunity from a relative to go to another game at Old Trafford to see Manchester United take on Aston Villa. It was only after I jumped on the opportunity, that I realized that this game was a chance for Manchester United to mathematically claim their 20th Premier League title. This time around; however, the tension was to a minimum. First of all, United was running away with the title and only needed to get a result in 1 of their next 5 games in order to win the title. Also, any concern that struggling Aston Villa was going to cause an upset was nipped in the bud when Robin Van Persie scored in the first 2 minutes of the game. He then put the game to bed with a hat-trick before the conclusion of the first half. Compared to the epic conclusion of the Premier League last year, where United’s cross town rivals, Manchester City, won the title with mere minutes to go in the last game, this was, admittedly, less squeaky. The consistency that United showed this year meant they won the title with emphatic confidence, rather than squeaky excitement. I am not saying that one way of winning is any less fulfilling than the other. I am sure the Euphoria is the same either way. However, on that Monday night against Aston Villa, the only squeaky bums in the last few minutes of the game, were those of the last few fans to jump up and join in the celebrations. To be at Old Trafford on the night United won a record setting 20th title is something that I will always remember. The highlight of the game was definitely the 2nd goal. I won’t explain it, I will just show you the video below. It was sublime! One of my favorite memories of the celebrations was singing the Man United version of John Denver’s “Country Roads”: “United Road”. I could have stayed in the stands all night singing along with the players down on the pitch. Back at Guiseley, the Squeaky Bums have been so loud recently there have been reports of anxiety attacks and insomnia. In personal news, I started my first league game so far this year. While the game meant little for the team in terms of final league positions, it was really only squeaky bum time for me; a chance to finally play significant minutes in a league game. In a way, it was like a 2nd job interview or audition. I was excited for the opportunity to play. Unfortunately, squeaky bum time only ends one of two ways no matter how well you play. You win or you lose. In this case, we lost…to the team in very last place; Hinckley United. The only thing that could have probably made it worse, is if I had scored an own goal and then got sent off. It was a strange game. I, and no one on the team, played particularly poorly, but something was amiss. Also, credit to Hinckley who was up for it and played as though they had nothing to lose (which they didn’t). Sometimes life just gives you those days and the best thing to do is move on. While I had my pout, as a club, we had bigger things on the horizon: Playoffs. A playoff is the quintessential Squeaky Bum scenario. In this case, four teams from the league (Blue Square Conference North) make playoffs; 2nd place through 5th place. As 2nd seed, we drew the 5th place team; Halifax Town FC our Yorkshire rivals. In the semi-final, you play two games; one home and one away. The team with the better record after two games will go through to the 1-game final. That is essentially 270 + minutes of Squeaky Bum football. The winner of the final earns the right to be promoted into the next division of football (Blue Square Conference Premier). The 1st leg of our semi-final was away to Halifax Town and went relatively well. It ended in a 1-1 draw. We were under pressure for most of the game as they used the momentum of the home crowd to keep us pinned back in our half. They scored from a penalty kick early in the first half and gave us a few serious scares throughout, including one or two off of the woodwork. Fortunately, we weathered the storm and managed to score our own late in the 2nd half through a towering header from the ever trusty central defender Danny Ellis. The remaining time was tense for both sides and but for a great reaction save from their goalkeeper from a Josh Wilson effort in the last minutes, we could have left town with all the spoils. In the end, we return home with all to play for at Nethermoor Park: home of the Lions. Tomorrow (Sat the 6th of May) is the 2nd semi-final game, which is really just a final before the final because we have to win or there will be no final. I know there are plenty of Guiseley fans who recommend me getting my head checked for supporting Manchester United. However, they would be happy to know that as I was singing and shouting after the game at Old Trafford, I couldn’t help but think to myself that the real celebrations will begin when Guiseley earn promotion. As I said, the longer the build-up, the squeakier the bums. Guiseley has been to playoffs three years running, the bums don’t get much squeakier than that. I would encourage you to follow the game tomorrow. Promotion is an equally cruel and exciting event and thus vastly entertaining! There will be a radio feed that I will try to get out to you before the game, but you can also follow Guiseley’s twitter, which will keep you up to date. I would also like to thank all of you who helped me with the fundraising for my mission trip. You’re generosity is incredible. If you didn’t get a chance last time, I haven’t quite met my goals and it’s getting to be Squeaky Bum Time in that regard. So if you are so inclined, I could still use a few pennies here and there. Please visit Mission Trip Fund Page to help out 🙂 Thanks again! Lastly, if you didn’t see it. I wrote a piece for the team website called A Mental Victory. I wrote it right after we beat the league Champions, Chester City, who have already earned promotion for finishing at the top of the league.